must be 178 LPI or 200 LPI or 215 LPI. We offer all configurations including CR grids, DR grids, Circular, Decubitus, Mammography, and carbon fiber grids. Flat Lexan® Encasements, grid caps, Lexan® encasements with cassette channels and grid cassettes. To obtain the most effective X-ray transmission and absorption, as well as grid density uniformity and precise geometric arrangement for strip focusing, we utilize the finest precision materials, such as aluminum strips with purity of 99.99% and a thickness tolerance of ± 0.02mm, and lead strips with a purity of 99.85% and a thickness tolerance of ±.001mm. passed the test for perfect strip alignment are delivered to our customers. The test film supplied with all our grids is your assurance of quality. 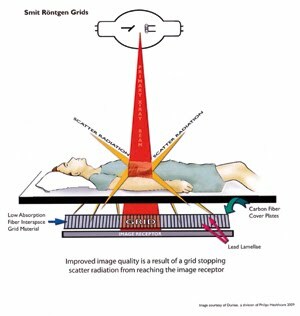 To produce the most succinct x-ray images, medical professionals seek out the aid of x-rays grids. These items offer a series of lead and aluminum parallel lines that attract e xcess radiation released from the x-ray equipment. By allowing the x-ray film grid to absorb the radiation, this creates a sharper picture. Since radiology grids alone are fragile, most users purchase x-ray grid protectors to keep them intact. The x-ray grids are built inside the grid protectors, which are available with aluminum or plastic encasements. Grid sizing correspond with the size of the cassette being used and are available for all cassette sizes. Easily slide or snap your cassette into the x-ray grid protection and together they are combine to create the most efficient image available. At Universal Medical, we offer two types of x-ray grid protection lexan x-ray grids and aluminum x-ray grids. Both types are available in two styles, slide in x-ray grid or snap on x-ray grid protector. Each x-ray grid is offered in 85, 103, 178, or 215 lines per inch configurations with various focus ratios to choose from. The manufacturer of your x-ray equipment should provide you with guidelines for the x-ray grid specifications that best suits your system.